If you love olives like I do, this Tuscan Olive Chicken is going to knock your socks off! 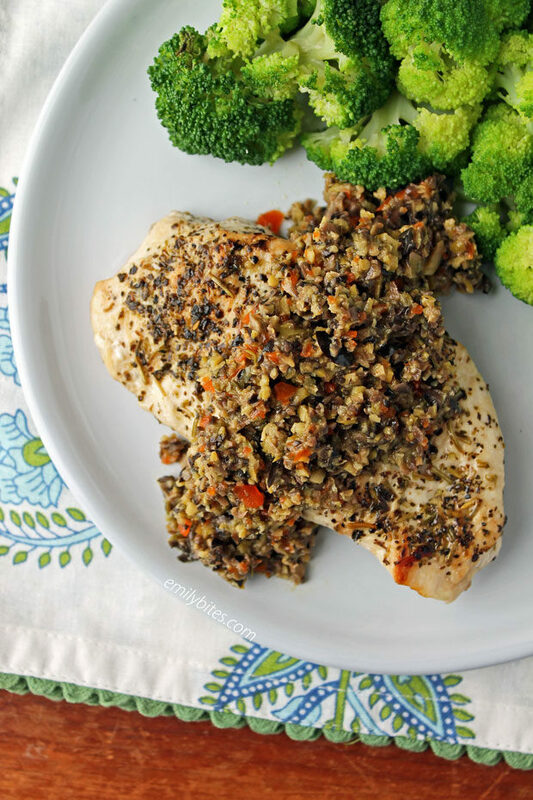 These juicy chicken breasts are coated in garlic and herbs and topped with a heaping helping of olive tapenade. If you’ve never made tapenade before, have no fear – it’s SO easy. You literally just put ingredients in a food processor and pulse it a few times and voila, homemade, restaurant-quality olive tapenade! I was originally going to call this something boring like Olive Tapenade Chicken, but I was describing it to my mom and she said “ooh, like a Tuscan Olive Chicken?” Exactly Mom, thanks for naming my dish! This dish is low in carbs, oh-so-satisfying and just 338 calories, 4 grams of carbohydrates, or 4 WW Freestyle SmartPoints per serving! Looking for more tasty, lightened up, creative ways to jazz up your chicken breasts? Check out my Crispy Cheddar Chicken with Cream Sauce, Barbecue Bacon Wrapped Chicken Tenders, Cream Cheese Stuffed Everything Chicken, Fiesta Stuffed Chicken, Bruschetta Topped Balsamic Chicken, Baked Chicken Tenders, Chicken Cordon Bleu, Mediterranean Topped Grilled Chicken, Pimento Cheese Stuffed Chicken, Antipasto Chicken Roulades, Cheddar Ranch Chicken Tenders, Chicken Milanese, Cheesy Bacon BBQ Chicken, Pesto Chicken Roulades, Lemon Pepper Iced Tea Chicken, Pizza Chicken Roulades, Hawaiian Chicken Skewers, Spinach and Artichoke Chicken, Thai Chicken Skewers with Peanut Sauce, Chicken Piccata and many more in the chicken section of my recipe index! Pre-heat the oven to 400 degrees. Line a baking sheet with parchment paper or aluminum foil and set aside. Place the chicken breasts on a cutting board and if necessary, pound with a meat mallet to ensure an even thickness. Combine the basil, oregano, and rosemary in a small dish and then sprinkle onto both sides of each chicken breast, pressing the herbs down to ensure they stick to the breasts. Drizzle 2 teaspoons of the olive oil into a large skillet or saute pan and bring over med-high heat. When the oil is hot, add the minced garlic and saute for a minute. Add the chicken breasts in a single layer and cook for 1-2 minutes on each side to lightly brown the outside of the chicken. Transfer the chicken breasts to the prepared baking sheet and cover them with another sheet of aluminum foil. Place the covered sheet pan in the oven and bake for 15 minutes. Remove the aluminum foil cover and continue baking uncovered for another 5-10 minutes (depending on the thickness of your breasts) until the chicken is cooked through. While the chicken is baking, place the black olives, green olives, garlic cloves, capers, lemon juice, mustard, and remaining tablespoon of olive oil into a food processor and turn it on or pulse a few times until the ingredients are finely chopped and well combined. 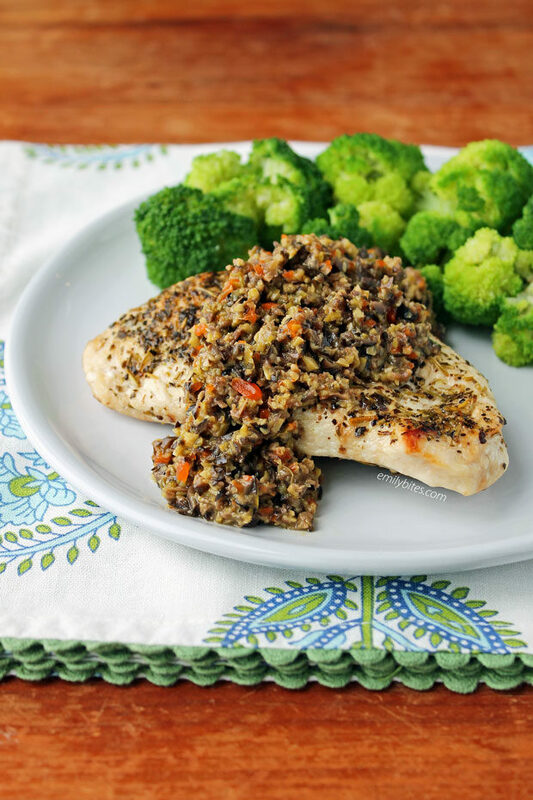 When the chicken is finished, top each breast with ¼ cup of olive tapenade and serve. I’m just cooking for one. Do you think the tapenade will keep in the fridge for a while? Hi Emily, I’m not a fan of green olives, is there a substitute or should I just leave them out of the recipe? You can try substituting another olive you do like, like kalamata maybe? I haven’t tried it that way, so if you test it out let me know!